Life in present times has become an increasingly rapid process of experiences and feedback. Businesses are always asking us to rate the services or experiences they offer. And often, they feel inclined to “reward” us for it. While no one’s complaining about the free stuff or great discounts, are we losing perspective of what’s genuinely good? Because, while the feedback is certainly far more in quantity, it can’t be as clean in quality. For starters, the moment you bribe (yes, a strong but apt word) someone for a feedback or to leave a rating or review, you’re automatically influencing the purity of the feedback, rating or review. Same goes for a 10% discount for simply “checking into” a restaurant. Everything from a review to get the free ‘dry fruit pickle’ or a discount on the food bill, establishments are literally paying to distort their own reality of their business. A few years ago, a friend of mine started a business, and reached out to friends on Facebook to like their business page. I was well past the years when I’d actually ask people to convince me (or at the least, fill the ‘About’ section on the page), before asking people to simply like the page. So, while I liked the page and got on with my work, some months later, seeing the 800+ likes, I asked how business was. There was none. Even though am quite sure a lot of common friends might have had a need for the products being offered. What happened, was that the Facebook page (in herd mentality), gave them a level of instant gratification, while distracting them from the core. Is, or how can I make my offerings increasingly relevant? Recently, an entrepreneur found me online and requested a meeting to help their business turn profitable and grow faster. They had exceptional social media following and activity, which of course I didn’t take at face value. But what came next from the entrepreneur was even more disappointing. That while a lot of the followers were fake, when visiting any business page, seeing a good following gives him a sense of trust and confidence too. That justified it. Let’s forget fake following and likes for a moment. Besides, I’ve already written a fair bit about them years ago. But consider just the fact of a business incentivizing a feedback or review that should ideally be happening without influence. Each time we do that, we willingly distort our sense of the pulse of our business. Last month, I had dinner at one of the Taj restaurants with relatives. While the starters and main course were exceptional, the service was aloof, and one dessert was a disaster. On another occasion, when at a relatives place, I ordered butter chicken from the Butter Chicken Factory, a nearby joint. The butter chicken was terrible! I wrote reviews about the Taj dinner and the butter chicken place on Zomato (neither ratings were too terrible). Both establishments responded. The Taj staff thanked me, saying they would incorporate the inputs. And that they looked forward to having me there again soon. The city head of the Butter Chicken Factory called to understand what in my opinion, they had gotten wrong about the taste. As I was busy, he called at a time I said I’d be free, and tried to understand. He had inputs of his own to reason out, like the very different taste of the dish in northern India and other places, and how theirs was influenced more by a certain part of the country. It was a good dialogue, with me recommending they try out the dish at another old joint which I knew, was good. This felt like a far, far more human and involved business, as opposed to a template perhaps pasted by the Taj folk. Now imagine, if the Taj people had offered me a 10% discount on my next visit. But the service remained unchanged and the same dessert was still on the menu, and still a dess-aster! Perhaps my reaction would have been milder, as I would have been indebted to the 10% discount. And the restaurant wouldn’t have learnt anything from the feedback. And these are instances that are still the more evident, at least to most of us. There are so many where one aspect of the business could cause us to completely write off another aspect of it. Or an offer could skew our perception of what we’ve just experienced, be it food, an experience, an electronic product, anything. A startup might justify the need to influence reviews to obtain a minimum critical mass to even survive. But in doing so, do businesses ignore real feedback and let performance slack? Thanks to early illusionary success, do they risk missing the growth bus? Here are two interesting incidents I came across online in the last week. One, about a seemingly harmless vulnerability in an online service’s process. The other, a possible vulnerability in human decisions in a human-dependent, traditional business. First of, a French literary buff, conducted an interesting experiment. It was to check his hypothesis, that the standards of publishing have fallen significantly. Writer Serge Volle, took 50 pages of one of the novels of a Nobel laureate Claude Simon, and sent it to 19 French publishers as his original work. Interestingly, 12 of the publishers flatly rejected it. The others never replied. While one could argue that publishers might have felt the content or style of this 1962 works, was not relevant for modern readers. However, one could also say that if these people can’t identify quality, how right are we to trust them with deciding if your works are good enough for readers or not. The other incident is even more amusing. An industry colleague of mine in the Design Thinking space shared this one on a group. A writer with an unusual name, Oobah (Butler), once upon a time, used to take small fees from local restaurants to write fake, glorifying reviews about them on TripAdvisor, even if he had never eaten at those restaurants. And this seemingly huge chink in the TripAdvisor process, got him thinking if he could better himself. And he did. He decided to list his messy shed as a restaurant on TripAdvisor, and then made it London’s top-rated restaurant, without having served a single dish. How bloody cool is that?! TripAdvisor folks later justified, saying their effort is largely channeled around eliminating fake reviews. Nobody in their right sense would create, or benefit from creating a restaurant that doesn’t exist. But it still is a gaping hole in the process. Point being, as we continue to be wowed by the latest of apps that simplify our lives dramatically, teams at those companies need to be constantly aware of how their simple-to-use service can be abused. You wouldn’t be reading this if you were fortunate enough to live a secluded life in the hills, which means you’ve most likely visited a reasonably-priced restaurant around. And you have probably noticed how the wash basins usually have water all around the tap/ faucet. Throw in some people who turn taps/faucets with soaped-up hands, or with food covered hands; and just washing your hands there suddenly becomes something of a daring act. 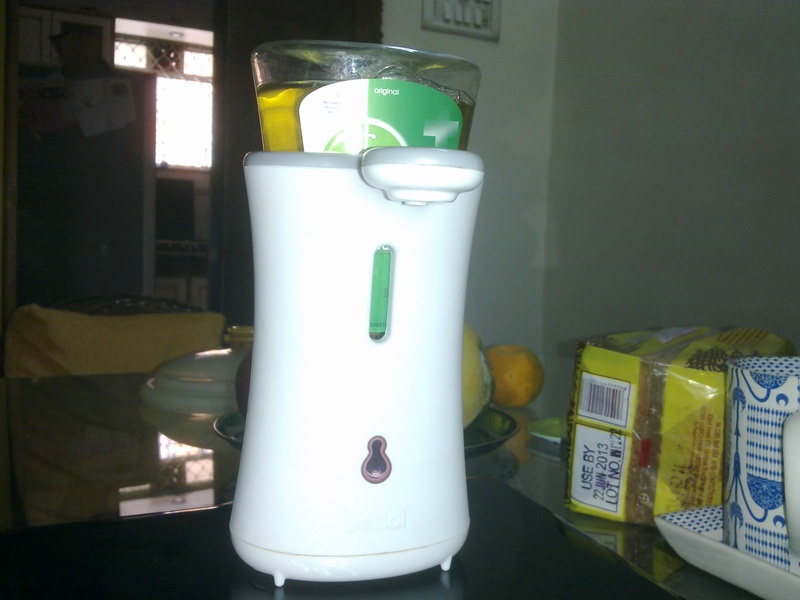 That being the case, and given that most eateries and homes at best have a press-the-pump type soap dispenser, Dettol, a household name in India, had a great business opportunity with a no-touch soap dispenser. Here’s what they did with it. A big flaw with the design, beyond the drab form. The battery compartment placed right at the bottom, with a thin cover that has a slight gap in it. Now, if only women walked the earth, this wouldn’t have been a problem considering how careful and tidy most women are. At least the ones I’ve known. But with us guys around, it’s another story. Me for one, even after just washing my face I usually look like I got hosed down. And I’m the least of Dettol’s concerns. Every few days, the dispenser at home either stops working, or dispenses four times repeatedly. That calls for wiping it dry, including the batteries and the compartment. Find me a restaurant or home who’s basin area is always dry enough to keep such a dispenser and not have water seep in. All the fancy hotels will be using fancier units anyway. Let’s look at pricing. Given the potential customer base, filled with wet basin areas, they could have easily taken a shot at replacing existing push-type dispensers, bars of soap and even soaps hanging from the wall by a rope [yes, you’re life’s incomplete if you haven’t used one of those] with an aggressively priced product. However, at INR 450 a piece, it is a little steep for the value shopper. It gets worse. The liquid is much thinner than most other brands, and the two variant choices you get smell between not good and horrible. And finally, price of refills. 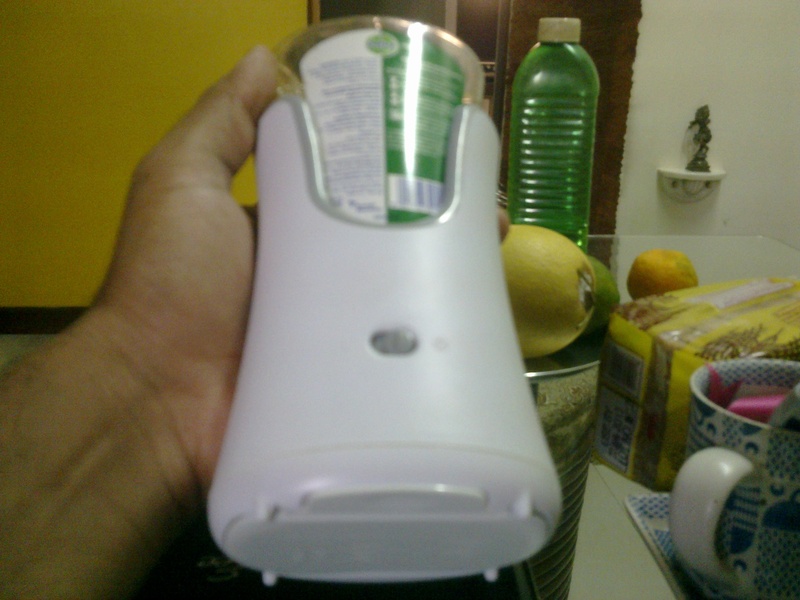 A single refillbottle (250ml) sells at supermarkets at INR 150 (strangely INR 99 on some sites online). Compare that with a thicker and better smelling refill by another leading brand which sells at INR 140 for a 900ml pack, that is quite a difference. And you can’t use any other liquid soap in this one due to the way the refill has been designed. Which means, you have to pay premium to continue using this dispenser. It’s one thing to attempt to shift the existing market with a quick first move that’s just ‘ok’, quite another to delight on your first shot. By the time you come around for a second pass, it might just be too late. [1/5] For just dispensing a sad smelling liquid soap, and for disappointing on design, ease of use, pricing, and on refills. There is this shopping place close to my office (don’t know if it would qualify as a mall, cause even though its got some of the characteristics of one, it does not feel like one). Anyway,I drop in there sometimes to grab a bite at a restaurant there. So once I enter the main gate, there are a bunch of security folk who may or may not check the boot and glove compartment of your car, but more often than not, they will still make it a point to ask you 2 things, your name, and where you stay. They seem to have cracked the code to a better and safer security process. These folk are skilled enough to supposedly be able to tell the good guys from the bad just by knowing the name and area of residence. Isn’t that terrific?! So I guess it is safe to assume that all the bad elements usually stay in the same localities. And that the mall folk know where those places are while our police don’t. And ol’ Shakespeare was confident enough to say ‘what’s in a name?…..’. We seem to take absurdity to unimaginably new heights everyday. That, or there is some reasoning behind it that makes this a far more effective tool as compared to searching the car. I don’t know. Author Shrutin N ShettyPosted on November 16, 2011 March 4, 2018 Categories Design Thinking, Not So SeriousTags mall, restaurant, security3 Comments on What’s in a Name?